BAPTISM (from the Greek word baptisma, a "dipping") is the sacrament in which, by water and the power of the Holy Spirit, a person is cleansed of all sin, including original sin, and experiences birth into the new life of Christ. 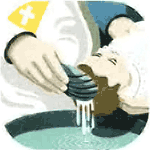 Words: "I baptize you in the name of the Father, and of the Son, and of the Holy Spirit." Baptismal Preparation Classes are a requirement for both parents and godparents who have not baptized within the last 5 years. You must register for the classes 10 days prior to the baptism and classes are given in English or Spanish. The Baptismal Form, Certificate of Suitability Form (for godparents) and Birth Certificate must be in the parish office 10 days before the Baptism. Baptisms are held on the 3rd Sunday of each month after 11:30am Spanish mass and on the last Sunday of each month after the 10:00am English mass. Baptisms take place in the Church. All first time parents who have not attended the baptismal class must attend it before Baptism of child. Godparents who have not attended the baptismal class must also attend it before becoming godparents. Click HERE to download the baptismal packet.